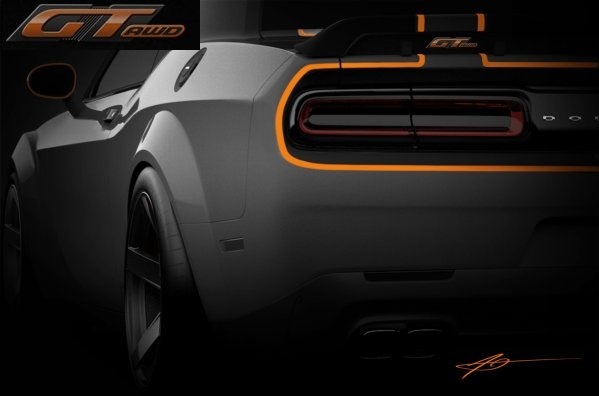 The Chrysler Group offered up a few teaser images ahead of the 2015 SEMA Show and one picture shows the back of a new Dodge Challenger with GT and all-wheel drive badging, leading us to believe that the Mopar crew is bringing an all-wheel drive muscle car to SEMA. This morning’s 2015 SEMA Show teaser release from Chrysler didn’t offer any information about this picture of what is clearly a Dodge Challenger, but we don’t need to see anything more than the decklid badging that reads “GT AWD”. I suppose that AWD could mean something other than all-wheel drive, but it seems very safe to speculate that this is an all-wheel drive Dodge Challenger. Unfortunately, we don’t know anything else about this car, so it is unclear what is under the hood, but the simple fact that an all-wheel drive Challenger could exist is sure to shake up the muscle car world at SEMA. Could an AWD Challenger Happen? There has never been a factory-built all-wheel drive muscle car, but it makes sense that the Dodge Challenger would be the first. The Challenger rides on a modified version of the Dodge Charger and Chrysler 300 – both of which are offered in all-wheel drive form. If the all-wheel drive tidbits fit in the Charger and 300 chassis, there seems to be no reason why a slightly modified all-wheel drive system wouldn’t fit in the slightly modified chassis platform of the Challenger. Also, Chrysler has experience with high performance all-wheel drive systems in the Jeep Grand Cherokee SRT8, so building an all-wheel drive setup for the Challenger that will handle some big power shouldn’t be a problem. In short, Chrysler seems to have all of the pieces to build the puzzle – but we should remind everyone that this is just a SEMA Show car, and there is that chance that GT AWD means something else. Since no information was offered on this Challenger GT AWD teaser image, we can only guess as to what is under the hood. The Charger and 300 are only offered in all-wheel drive form with the Pentastar V6, but I can’t imagine Mopar bringing a V6 Challenger out as a featured vehicle. Because of that, I expect that it will pack Hemi power – but with three Hemi V8s available in the current lineup, the output of this car could vary from 375 horsepower to 707 horsepower. There is also no information on what transmission is employed in the Challenger GT AWD, but since all of the previous all-wheel drive LX chassis vehicles have had an automatic transmission, I would expect the 8-speed auto to be at work in this SEMA Show car. Finally, this Challenger appears to have some bigger wheels and a unique stance, so like any good Mopar SEMA Show car, this car probably has suspension work and a dressed up interior. Unfortunately, we will have to wait for the SEMA Show to open on November 3rd before we get more information on the Dodge Challenger GT AWD, but even in concept form – an all-wheel drive Challenger will shake up the muscle car world. An AWD HEMI Challenger? That would be an interesting ride.